The method of designing from big to small is a technique for experienced Gamestar Mechanic designers, and it’s a helpful way to create elaborate games. The big-to-small method requires you to build the form of the level and then work down to the function. This design method can be challenging if you misjudge the spatial requirements, but the payoff can be deep, well-shaped gameplay and immersive visual elements. Build the outline for the level. Set up the format for the type of level you want to design: Set the dimensions of the level, draw out the rooms with block sprites, and define the position of any large structures or gameplay elements that you want to include. Think about what you would want your level to look like if you handed someone a tour map of it. If you’re confident enough, you can detail many of the overarching visual elements. Completing the Level Map Challenge can be useful for this step. Divide the level into sections. Figure out where you want to place your goals and obstacles. Sometimes, you need only one section; at other times, you may want to create a section, complete the next step, create another section, and so on. Build the challenges in each section. After you complete your template, start working more narrowly until you have a challenging game that fills the whole level with interesting ideas. The big-to-small approach is particularly helpful when you know how you want an entire level to flow but aren’t yet sure of the components. When designing components, don’t be afraid to edit your game plan to fit your ideas — if you find a creative way to make a component work, it can improve the outline. This approach works well when developing games with large, elaborate levels, but it can also be applied to make a game less linear. Whether the outer layer is a map, a mechanism, or another structure, the big-to-small approach can help you visualize your game without getting distracted by details. 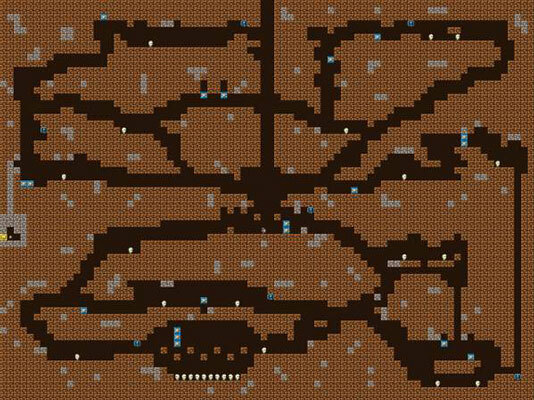 This game seems to be designed from big to small: The structure consists of a number of rooms connected by passages, and the pieces of these structures are filled out by elevators and small challenges. Many designers work both from the bottom up and from big to small when designing games. For example, you might create the general structure of a game and then work from the bottom up to construct each section. You might also come up with an interesting short-term concept and then use the big-to-small approach to build a game around it. Don’t feel that you’re limited to just one of these approaches, and apply whichever one you feel is appropriate.